When one thinks of Iowa, a specific image comes to mind: One of soft rolling hills, and farms as far as the eye can see in all directions, where the sky can sometimes take on a characteristically midwestern form of murky thin cloudiness, giving a feeling that is neither cloudy nor sunny. Traveling across the state, this scene shifts quite little as the miles go by. The scenery is as steady and reliable as the culture. Some people have a deep appreciation for the role that this corridor plays in agriculture and transportation, as indicated by this wall art at the Worlds Largest Truck Stop. Others find it monotonous and unbearable. 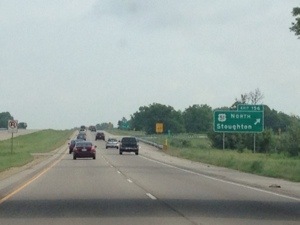 People have even written parodies about how uninteresting and unpleasant a drive across Iowa is. However, as is the case with most places, there is more to it than what one will see from an interstate highway, whose primary purpose is to provide the most efficient route between cities for trucks. 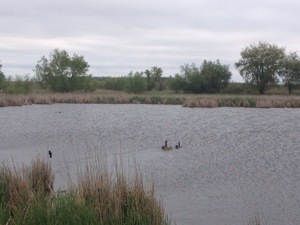 Tucked away among the endless miles of corn fields are a surprising number of lakes that cannot be seen from the interstate. As well as the sites of a surprising amount of our history. Most music fans are familiar with “The Day the Music Died“, February 3, 1959, when three of Rock and Roll’s biggest stars were all killed in a tragic plane crash. It was an event that nearly torpedoed the still young music genre’s rise to the top. It had the potential to significantly change the path music took for the remainder of the 20th Century, which could have had a major effect on the social and political movements that transformed our society from the middle of the century to where it is today. What few people know, though, is that all of this occurred in Northern Iowa, in a town called Clear Lake. Clear Lake is a town not unlike many other towns in Iowa, and the structure and establishments feel generally like anywhere in the Midwest. Like many place in Iowa, it has a surprisingly beautiful lake, depicted at its best by this postcard. It is also home to the Surf Ballroom, the last place anyone would ever hear the three stars of early rock and roll on the night of February 2, 1959. Why they chose to play at this spot, on this date, feels both natural and confusing at the same time. Perhaps because it is well preserved in its 1950s form, the venue itself feels like the exact place one would expect to hear Buddy Holly, Ritchie Valley, and the Big Bopper. It was also likely the right size, given the types of crowds that a music genre that was hot, but not quite mainstream would attract at that time in history. With traveling being a little more difficult than today, as the interstate highway system was just being built and flying was more likely to be prohibitively expensive, it seems logical for tours to come to smaller towns. Today, it would be more likely for musical acts to have tours that cover larger distances, such as a North American tour. Fans in Clear Lake would be expected to come to Des Moines or Minneapolis to see a show. Then, it was harder on both the band and the fans. However, I still wonder, why Iowa, and why in winter? Inclement weather is one of the reasons for the plane crash. Another is how the tour, labelled the 1959 Winter Dance Party Tour, was planned, as indicated by this display. They toured by bus. So, having a tour date in Kenosha right after Milwaukee makes logistical sense. After that, the schedule had them meandering all over the place. These dates were all back-to-back. The show at the Surf Ballroom came at a particularly grueling time, having played in Green Bay, WI the night before, and having a show scheduled in Morehead, MN the next day. Frustrated, Buddy Holly chartered a plane to the next show- the plane that would kill the three performers. One could say that February 3rd was the “Day the Music Died”, but it was a combination of poor planning and a harsh Midwestern winter that killed it. However, as anyone reading this in the 21st Century knows quite well, the music didn’t really die that day. A few years later, rock music would be infused with fresh life, in the form of new bands that would later be counted amongst the best of all time. The Surf Ballroom also refused to let the music die. They continued to host musical performances of all kinds, and still do to this day. They have hosted some of the all time greats. While also staying in the here and now. Road trips are certainly more appealing when they involve more than just traveling from one destination to another, but rather, leave time to explore some of the places in between. Every place that exists, big or small, new or old, has a story to tell. The story of one small town, one of many, tucked away behind the interstate by one of Iowa’s gentle rolling hills, certainly ignites the desire to explore more, eagerly anticipating what is around the next corner, over the next hill, just beyond the horizon. This entry was posted in Concerts, Historical Locations, history, Iowa and tagged Clear Lake, history, Iowa, Surf Ballroom, travel on June 15, 2018 by Stephen Jaye. There is no road that I know better than Interstate 90. Before moving to Denver last year, I lived in the Midwest for 19 years. In that time, I attended High School, College, Graduate School, and started my first job. I lived in Illinois, Indiana, and Wisconsin. But, I never lived more than 10 miles from I-90. I drove back and forth on that road so much that I once claimed that I could tell at least one story about every exit on that road from South Bend to the Dells. Today’s journey began on that all to familiar road. It was surreal to be driving past the same places, looking at the same exits, and reminiscing about the same stories, the same people, but keeping in mind that I no longer live here. It was almost like a journey into another life, but one that I am still living. We got an early start on June 1, and raced across Wisconsin. Well, raced is a relative term. Wisconsin remains, along with Illinois, the only states in the Midwest to still have a statewide speed limit of 65. In addition, unlike in Illinois, they are looking to pull you over. Regardless, we still go to LaCrosse in 4 hours, with our first stop being in Sparta, WI. Sparta is known as the “bicycle capital of Wisconsin”, which, as a bike enthusiast, makes it near and dear to me. In fact, I had ridden through Sparta in 2006, on a ride across the state. It is where the LaCross River Trail ends and the Elroy-Sparta trail begins. Both are bicycle trails created from abandoned rail beds, and quite fun to ride. Sparta hosts a bicycle museum, and has even placed bicycle images on their road signs! In LaCrosse, we did something I am not accustomed to on road trips. We actually stopped at a microbrewery to sample some beer. 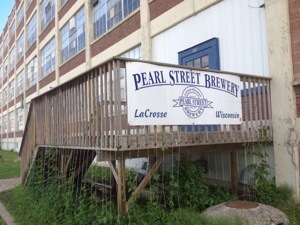 The Pearl Street Brewery would not open for tasting until noon. 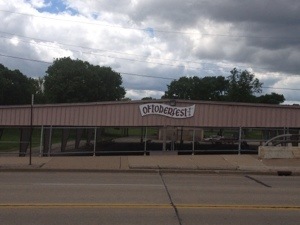 With a little bit of extra time, we went downtown and checked out some sights, including the grounds of Oktoberst. LaCrosse is said to have one of the best Oktoberfests this side of the Atlantic. I regret never having gone there, but I did live in Madison, and living in Madison is almost like a non-stop Oktoberfest! After sampling some good beer, it was time to tackle a new state, Minnesota. When it comes to states to drive across, Minnesota is the ultimate tease. The first ten miles are utterly spectacular! The road follows the bluffs of the Mississippi River, which are almost at their best here. In fact, this is my favorite Mississippi River crossing (with St. Louis being a close second). Unfortunately, after those ten miles, the surrounding scenery suddenly goes dull. I mean suddenly! At mile marker 267, you suddenly enter a mainly flat terrain full of corn fields. It stays that way for pretty much the entire rest of the state. 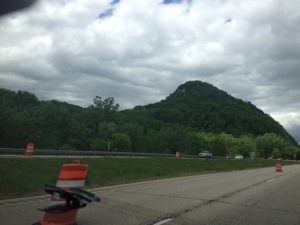 So, essentially, Minnesota presents itself to the westbound I-90 traveler as quite exciting, but ends up manifesting as dull and frustrating. It reminds me of our own government, but that is another issue. Today’s destination is Spirit Lake, Iowa, for some camping. Spirit Lake, despite being in Iowa is only about 20 minutes off of I-90. 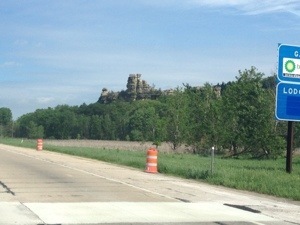 The drive is quite easy, and, to be honest, I do not notice the difference in scenery between Iowa and Minnesota. I would say that the part of Minnesota I had been traveling through today is like more like Iowa than the rest of Minnesota. 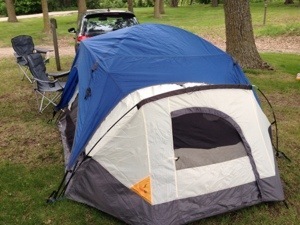 However, ironically, the part of Iowa I end up camping in may be more like Minnesota than the rest of Iowa. Specifically, I am referring to the size of the lake. Minnesota, of course, is known for its lakes. Every time I visit the state, it feels like half the population owns a boat. In fact, the state motto is the “land of 10,000 lakes”. Iowa may not be lacking in lakes the way many states out west are, but it isn’t known for it’s lakes. But, Spirit Lake is a place where life pretty much revolves around the lake, much the way it does for many places in Minnesota. I am very proud of myself on this day. I put up the tent all by myself! Yeah, this is something that many people know how to do, but it is a skill I never developed, and really need to have. Especially, if I really want to dive into the experience of living in Colorado, and, what is the point of moving to a new place if you don’t plan to experience it with all you’ve got. The evening was all about spending some quality time with good friends, the kind of people you truly feel comfortable around. We goofed off, we grilled, and played frisbee in the park. We had a few drinks, and got a bit loopy. My friend Jason found a way to break a rock trying to break a gigantic tree branch to make more firewood. It was quite hilarious. More importantly, we talked about some real stuff. The kind of stuff that people don’t seem to talk about anymore. People, society, who we are, where we are going, what we need in life. I have no idea why people don’t talk about all this anymore. Maybe it is the constant distractions. It seems like we are more connected than ever, but also more isolated. I really don’t know what I personally can do about this, but be there for people when they need me, which I plan to do. If I can reduce the amount of loneliness in this world, I could truly be of service to humanity. Maybe this is the kind of realization people tend to have on a quiet (somewhat, as it has been windy) night in a lake in North Central Iowa. 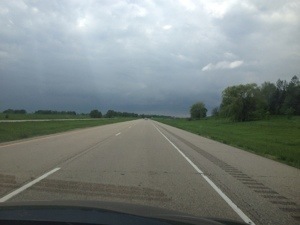 This entry was posted in Camping, Illinois, Iowa, Minnesota, Road Trips, Wisconsin and tagged Camping, Illinois, Minnesota, Mississippi River, Road Trip, Wisconsin on June 5, 2013 by Stephen Jaye.